It's big, it's green, and it's back. 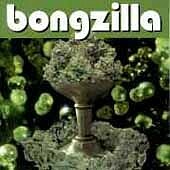 Building on a solid foundation of 7" EPs, BONGZILLA now gets to blow smoke for an entire full length CD. This is really the band's first chance to develop their Sabbath worshiping dirges to their full extent and they do themselves proud (most of the time). As a non-pot smoker it is a bit amusing (maybe even bemusing) to hear song after song dedicated to one subject. Like the band TANKARD and their endless fascination with beer, BONGZILLA run the risk of becoming boring with their one track mind. Fortunately enough they seem to be aware of that fact and rely very little on the lyrics. They also vary their lyrical approach from time to time and explore other issues raised by the "war on drugs". The best example of this is track 5, a massive sludge fest called "Prohibition (4th Amendment)" where the band recites the part of the fourth amendment of the U.S. Constitution that supposedly protects us from unwarranted search and seizure. Re! gardless of your personal ideals regarding pot use, if you like to inhale bone crushing sludge doom, this is your bag (all puns intended, of course).